We have a fun, interesting and unique YA book featured today as the Jane Unwraped Blog Tour makes a stop with us. 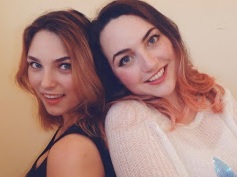 We have our review and there's a giveaway! Enjoy! Fluorine uranium carbon potassium. Jane’s experiment really went wrong this time. After a fatal accident, teen scientist Jane becomes the first modern-day…mummy. Waking up in the Egyptian underworld without a heart certainly isn’t the best—especially when it means Anubis, god of embalming, has to devour her soul. Yuck. But when Jane meets the drop-dead gorgeous god, suddenly she's thinking this might not be the worst thing to happen. And then Anubis asks her to do the impossible—just time-travel and kill King Tut. Well, every experiment has variables which can end in disaster… Jane just wishes she could decide whether she wants to strangle Anubis or kiss him. Cover comment: It's okay. I like the purple and the art. 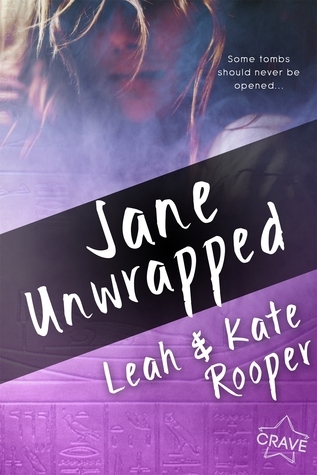 Jane Unwrapped by the incredible writing sister team of Leah & Kate Rooper is a fun, fun read! filled with Egyptian mythology (and a couple of historical hotties), this YA novel has it all from action, adventure, romance, some kissing, all while featuring a strong-minded heroine who loves science. Jane is so admirable (even when she's acting like a teen) and I totally got behind her as she winds up in the Underworld in the Duat and meets a god named Anubis. Oh no, is she dead? Poor Jane! But wait, there's more. Jane finds out something about her soul and how she can find it in order to help herself (which entails her taking something from King Tut) so she can move on and so her adventure continues. Whoa, Jane certainly is in a pickle. The Rooper sisters really created quite a wonderful world to entrance readers with their factual details and touches. I loved getting lost in the history and the lore (mummies, the afterlife, and more), feeling I was right there exploring and learning along with Jane. Then there is the other narrator of Jane Unwrapped, Anubis. So glad the authors gave us both. He's a fascinating god and the more I got into the book the more I fell for him and his growing relationship with Jane. My, my, my...loved the emotion between these two! The writing was fluid and the pacing held steady, flowing from the change in narrators without any blips. I thought both characters were well-developed and changed throughout. I did find myself wanting some more depth about their relationship. All in all, this book was entertaining and introduced me to the wonders of ancient Egypt. Talk about refreshing! Jane Unwrapped is a unique, fun and ultimately addicting YA read! Thanks to Entangled for giving me the opportunity to read this engaging book. I don't think so, it kinda sounds creepy. I mean I suppose since I'm dead what does it matter but I'm still considering being cremated...bugs freak me out so I don't think I want to be buried either.